InfoComm International has announced the 2016 recipients of its annual awards. 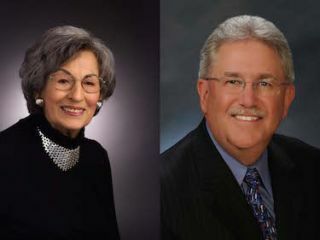 Rose Shure and David BrightEach year, InfoComm recognizes outstanding AV professionals for their contributions, leadership and commitment to excellence. In 2016, the InfoComm Awards Committee, a panel of volunteers, received nominations from across the AV industry and named winners for the Mackey Barron Distinguished Achievement, Adele De Berri Pioneers of AV, CTS Holder of the Year, Educator of the Year, Women in AV, and Young AV Professionals Awards. The Harald Thiel Volunteer of the Year Award is bestowed by InfoComm staff. The Awards Committee did not name a winner of the Fred Dixon Service in Education Award for 2016. "This year's group of distinguished award winners represents the best and brightest in our industry," said David Labuskes, CTS, RCDD, executive director and CEO, InfoComm International. "If there is one thing they all have in common, it's their commitment to giving back to their fellow AV professionals; their commitment to mentoring, inspiring, leading, innovating, and educating so that the whole industry benefits and continues to grow." Service and Small Systems Manager, Electro Acoustics Inc.
Lead Audiovisual Design Engineer, Zdi Inc.